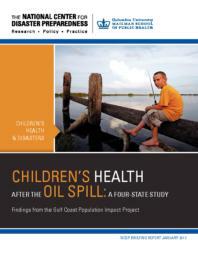 In 2012, with funding from the Baton Rouge Area Foundation, the National Center for Disaster Preparedness (NCDP) at Columbia University, in partnership with the Children’s Health Fund, launched a four-state study in order (1) to identify communities of children in the coastal areas of Louisiana, Mississippi, Alabama and Florida who were adversely impacted by the Deepwater Horizon oil spill, (2) to explore the prevalence of physical and mental health effects among these children, and (3) to conduct a preliminary assessment of the health services available to these children and the potential for targeted interventions or health system enhancements. We identified fifteen communities with higher numbers of BP compensation claims submitted by individuals and by businesses, and which also had higher rates of oil washing up on their shores based upon monitoring data collected by the National Oceanic and Atmospheric Administration. Over a span of four and a half months, a field team of six interviewers and two field coordinators completed 1,437 face-to-face household surveys. The parents whom we interviewed reported considerable exposure to the oil spill as well as a number of physical and mental health problems among their children. Over half of the parents interviewed in these highly-impacted communities reported that their children had some type of oil spill-related exposure, whether it was through physical, environmental, or economic factors. One in every five parents said their children had direct contact with the oil; one in four reported smelling strong oil-related odors; and two of every five said their household had lost income or a job since the oil spill. A little over 40% of parents in these high-impact communities reported some type of health effect experienced by their children since the oil spill. 18.1% of the parents said their children had experienced breathing problems after the oil spill, 14.8% noted skin problems, 16.0% reported visual problems and 21.6% mentioned emotional or behavioral problems since the oil spill. In October 2012 our research team traveled to four communities to interview local officials and leaders and conduct in-depth parent focus groups. We selected the four communities based on the household data, where parents had reported significant health effects. Across the four communities, the team heard of significant issues related to children’s health and well-being.